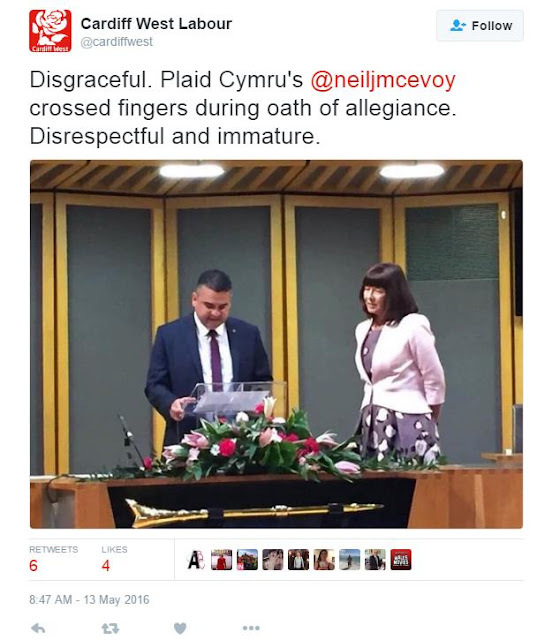 If we take Cardiff West Labour's word as gospel, that means that crossing your fingers during the oath is both disrespectful and immature. Good thing Labour don't do this themselves or it would look hypocritical. For good measure I spent two minutes googling and Cardiff West Labour may be horrified at what I found. Tony Banks was caught on television crossing his fingers during the oath and Dennis Skinner was heard on a microphone adding "and all who sail on her" after the words Queen Elizabeth. On another occasion the MP for Bolsover murmured: "I can't swear allegiance to a Queen who refuses to pay taxes." A LABOUR MP has been labelled a hypocrite after calling for the end of the monarchy - at the same time as he swore allegiance to the Queen. Richard Burgon, who was elected as the new MP for Leeds East two weeks ago, has provoked anger for his actions and even calls for him to resign. Before taking the mandatory oath of allegiance to Her Majesty while being swore in to the House of Commons yesterday, he said: "As someone that believes that the head of state should be elected I make this oath in order to serve my constituents." Former cabinet minister and left-wing campaigner Tony Benn once revealed in his diaries how he used to kiss his own thumb instead of the Queen's hand, by holding it out across the back of her hand. "I always put my thumb out and kissed my thumb," he said. Former deputy prime minister Lord Prescott told BBC One's Sunday Politics show that he had objected to kneeling in front of the Queen and kissing her hand when he became a Privy Counsellor. "I didn't want to do that. I thought that was a stupid arrangement. I still think it should go, but you don't do that, you hop, get into hoping, you hop from one chair to another and brush your lips lightly across her hand," he said. He said he was told if he refused he would not get the same information as the prime minister, adding: "That's quite wrong. You can't refuse a member who's elected simply because of some royal prerogative." And it also goes straight to the top. Jeremy Corbyn tonight did not bow to the Queen as he was sworn in as a member of the ancient Privy Council at a ceremony in Buckingham Palace. The staunch republican, who will now be known as Right Honourable, met the Queen for a short ceremony in which tradition dictates he should kneel before her and kiss her hand. After weeks of speculation about whether he would follow the ancient ritual, Labour insiders told MailOnline he 'complied with the normal process'. However, it later emerged that the ceremony had been tweaked to avoid embarrassment for both the monarch and the politician and that Mr Corbyn did not kneel. Good job he likes to sing the anthem though. Jeremy Corbyn was on Tuesday branded “disloyal” for refusing to sing the national anthem on a day of chaos which saw one of his shadow cabinet ministers threaten to resign over the European Union. The new Labour leader faced heavy criticism for standing in silence while God Save the Queen was played during a Battle of Britain remembrance ceremony at St Paul’s Cathedral attended by the Prime Minister, Defence Secretary and scores of military leaders. We know that Labour has republican's within their ranks who cross their fingers when taking the oath but they still take the oath because if they didn't they would not be allowed into the parliaments they were elected to. We know that the leader of the Labour Party refused to kneel before Betty but still had to endure the rest of the archaic procedure because of the apartheid system that Prescott referred to. For the sake of 'labouring' the point here it is again. We also know, because the English press banged on about it for so long that he refused to sing the worst anthem in the entire world at a remembrance event. If this is the best that Cardiff West Labour can do then I'm thrilled because this stuff almost writes itself. I'll leave you now with the words of Kier Hardie about a future English king. For the benefit of Cardiff West Labour (as I'm sure the rest of the readers will already know) he was Labour's first MP and helped found the party. From his childhood onwards the boy will be surrounded by sycophants and flatterers. In due course, following the precedent which has already been set, he will be sent on a tour of the world and probably rumours of a morganatic marriage alliance will follow, and the end of it will be the country will be called upon to pay the bill. Hi WnB been trying to reply to your twitter dm but can't get it to work. I don't know of any book specifically about Radnorshire dialect but my guess it was a chapter in the book Radnorshire by W Howse published just after the war. He also had a shorter work called Radnor Old and New which also covered dialect. East Radnorshire words in the main. Some WI published a booklet around 1988 but I've never seen that and there is also a more recent book with a chapter on dialect Folklore of Radnorshire by Roy Palmer. Scumbag Labour - I'r Gad Alun! The hypocrisy of the UKIP haters.